Eye shadow is designed to bring out the best in your eyes. Believable and blendable color is the difference between hearing 'I love your eyeshadow' and 'your eyes look amazing!' Vote for believable and blenadable every time! Matte All Over Color: Rich, high-pigment, matte finish. Smooth, luxurious texture. Non-drying formula conditions during wear. Looks great with all eye colors. Top Left: #259 ~ The can not live without neutral real deal! Bottom Left: #283 ~ If you want a little extra zip in your overall eyeshadow color, this color simply must be in your must haves. Sheer Satin Color: Sheer color simmer finish. Apply dry or wet for a richer luster. Wear alone, or over matte shades to add soft lights. Designed to work with all eye colors. 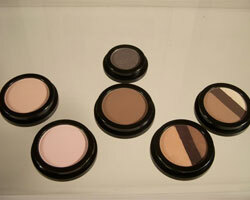 Top Middle: #5A13 ~ Out of the fog, perfect contour color to emphasize your eyes. Bottom Middle: #268 ~ The simple way to express your eyes without a lot of effort ~ perfection has met its match. Triple Split Color: One eye shadow 'split' into three coordinating shade. Wear the medium tone on the lid; the dark in the crease and along the lash line; and the lightest as highlighter. Top Right: #Utopia ~ If you desire a simple yet elegant finish to your eyes in one easy compact ~ you will love Utopia. Bottom Right: #Urban ~ For the times when you feel a little city like, Urban has just enough glitz to add to your glamour day or night.